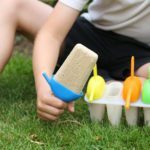 Ginger Fudge Vegan Ice Lollies & Optimum Vac2 Vacuum Blender Review | The Free From Fairy. These ginger fudge vegan ice lollies are perfect for the glorious weather we are currently experiencing. As you all know, I like to avoid sugar as far as possible and the kids are always asking for ice cream. So my answer to this was to use a recipe by Naomi Devlin as a base, and make it my own. 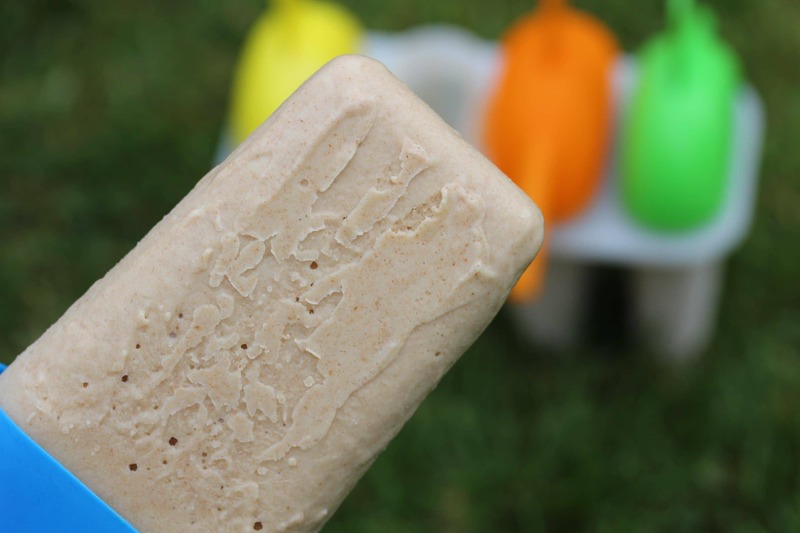 These ginger fudge vegan ice lollies take literally minutes to put together. It’s just the annoyance of having to wait for them to freeze. When is someone going to create a freezer that can freeze things in minutes instead of hours? All you need for these lovely fudgy treats is a can of coconut milk (I use the Coconut Merchant one because it’s organic and doesn’t contain strange ingredients like some), some medjool dates, vanilla extract and ground ginger. But there is also one key thing that will make your life easier. An Optimum Vac 2 vacuum blender. This fabulous piece of kit allows me to make flour from grains (think oats for oat flour, nuts for nut flour, rice for rice flour etc), nut butters, humous, smoothies, waffle and pancake batter, soups, dairy free milks etc etc. It also makes light work of these ginger fudge vegan ice lollies. You literally place all the ingredients into the jug, switch it on and allow it to blend the mixture into smooth, creamy deliciousness. The Optimum Vac 2 blender is pretty unique in the world of blenders. When I was asked if I would like to try one out in return for a review I was intrigued. They claim that by using the vacuum function which extracts the air from the jug, no oxidation happens to the ingredients thereby preserving the nutrients for longer. 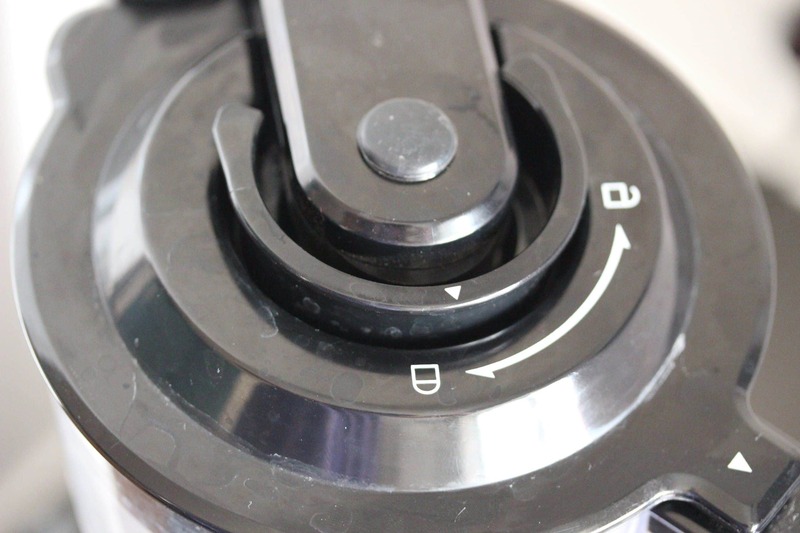 When used for making smoothies the vacuum function also prevents bubbles from forming and stops the mixture separating and changing colour if you leave it. I tried this out a few mornings ago when I was making my daily chocolate and banana kefir smoothie and it worked. No bubbles in the mixture and no separation even after leaving it overnight in the fridge. Impressed. If you want further proof, check out my friend Eva’s review of the blender where she did a little video showing this in action. Once I’ve made my kefir smoothie I then give the jug a little rinse before adding the ingredients for my waffles. Within a minute I have the waffle mixture, way quicker than it takes for the waffle maker to heat up. I can also sneak other ingredients into the waffles like chia seeds and vegetables because the blender obliterates them leaving the kids none the wiser. Sneaky eh? 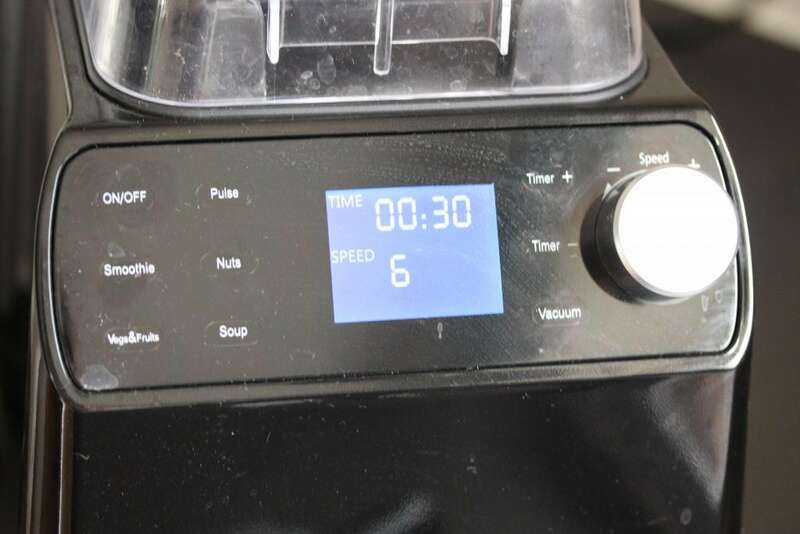 As you can see from the photo above, the blender comes with a number of presets. This makes is so easy to create things with minimal intervention. It’s powerful 2238 Watt motor combined with 6 steel blades means the machine can cope with most things, including those pesky chia seeds that often don’t get crushed in blenders. It has a huge 2 litre jug (great for batch making soup) made from BPA plastic, meaning it is safe to add hot liquids. The one thing that annoys me about the blender is when making nut butters. Because of the size of the jug it is hard to reach the nuts with the tamper (prodder thing that comes with the machine), unless you use loads. So for nut butters I tend to rely on my mini food processor still, which although takes a long time, does get the job done with a handful of nuts. You’ve been very patient so far, but in case you’re interested in getting one for yourself I’ve got a discount code. If you enter AMB20 at the checkout you’ll get £20 off your machine plus free post and packaging. In addition to that they currently have £100 off. If you follow this link I’ll get a little commission if you decide to buy (while you pay the same price) which allows me to continue running this site (thank you). 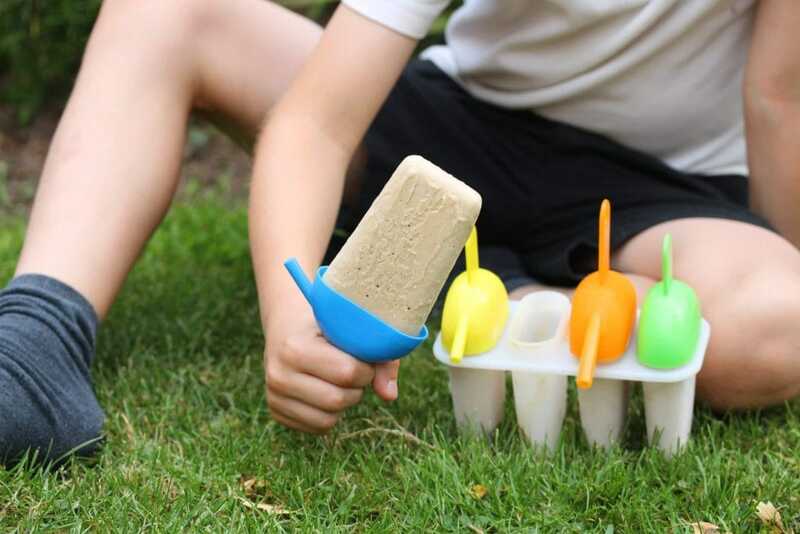 To remove from the moulds run under cold water for a few minutes until, pulling gently, the ice lolly comes out. Oh yes! Make it easier for photography too!! I love dates but have never thought of putting them in lollies/ice cream! I’m going to give this a go – thanks for the recipe! 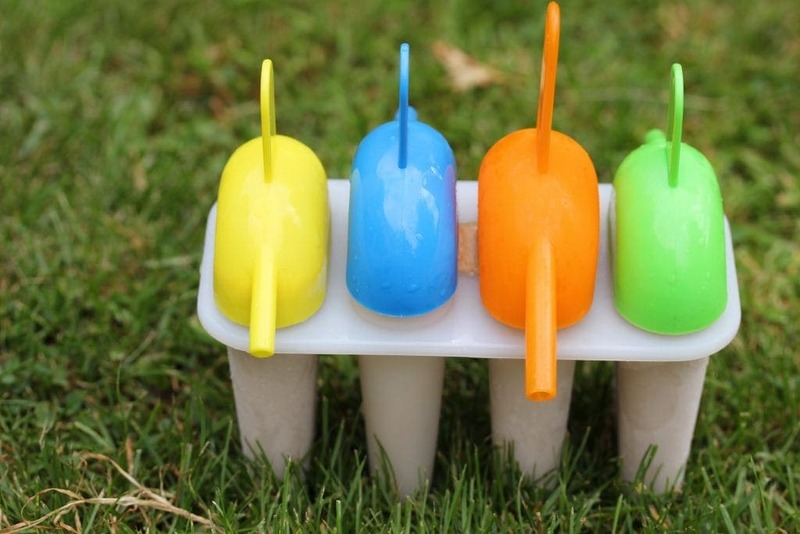 These lollies sound absolutely gorgeous, especially with a touch of ginger. I don’t know where we’d be now without medjool dates! I can see where you’re coming from re the nut butter. I’ve made a large quantity quite successfully, but I do find it annoying when I just want to make a bit of something, like pesto. As for the vacuum function, it’s fab. We have kefir smoothies most mornings and I make enough to last us 3 days – no separation and no discolouration. I know! Dates! I love them.